Generally speaking, there are two kind of notifications: Local notifications and push notifications (also called remote notifications). Locale notifications are scheduled by the app and can be triggered by time, date or place. Push notifications on the other hand are sent by a backend. This can be your own backend, but also a cloud service your are using. The handling of notifications have been massively simplified with the introduction of the Messaging framework in iOS 10. In this tutorial we will speak about both local and push notifications. We assume, that your app is targeting at least iOS 10. We start by looking at local notifications. They are easier to handle than push notifications and are a good foundation for understanding push notifications. Before your app can send any type of notification, you have to request the permission from the user to do so. This makes a lot of sense because notifications are very prominent. If the user wants to receive notifications from your app, that’s a good thing. But if the user didn’t have the possibility to disable notifications for an app, they could be too much of a distraction. The requestAuthorization method triggers an alert view, which asks the use whether he allows the app to send notifications. The first parameter of the method takes an array of options. These options indicates which kind of notifications your app is using. In our example, these are alerts, sounds and the badge indicator at the app icon. Additionally, also CarPlay is available. The second parameter is a block, that is called after the user has responded to the alert view. The granted parameter tells you how the user has decided. If the user gave the permission, your app is now ready to schedule and send notifications. This is a very basic notification, that has just a title, a body text and the default sound. You can of course add a lot more to the notification, like a badge counter information, a custom sound or additional information, that can be accessed by the app when the user taps on the notification. UNCalendarNotificationTrigger : With this trigger you can specify date and time for the notification. UNLocationNotificationTrigger : Here you can specify a location. When the user enters that region, the notification will be fired. The request just needs the content, the trigger and an identifier. The identifier is used to identify the notification. If your app sends another notification with the same identifier, the first notification will be overridden by this new notification. Before iOS 10, it wasn’t possible to display notifications automatically when the app was in the foreground. Instead, you had to display them by using a custom implementation. Inside this callback you can for example launch a specific screen. Now you know the basics of local notifications. It’s time to look at the hard stuff: push notifications. 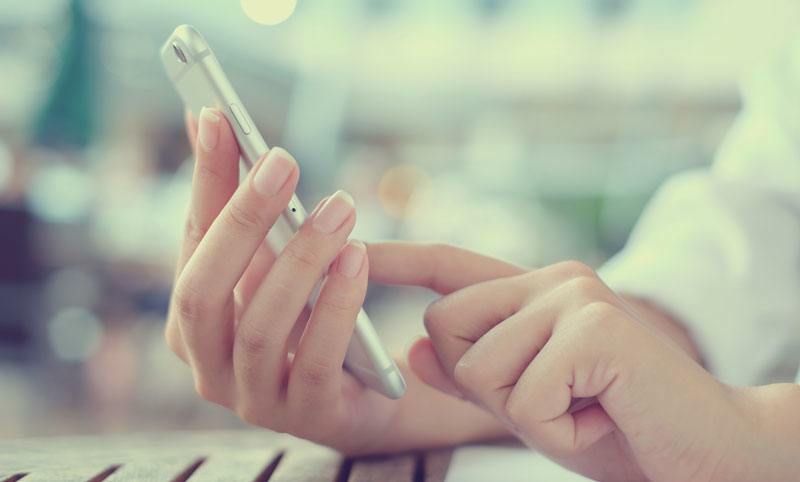 Let’s start by talking about the general process of sending and receiving push notifications. First, the app requests to get registered for remote notifications. When the registration was successful, the APNS sends a token to the device. The device hands the token over to the app. The app sends the device token to the backend (or some kind of cloud service), so that the backend knows how it can identify the device. 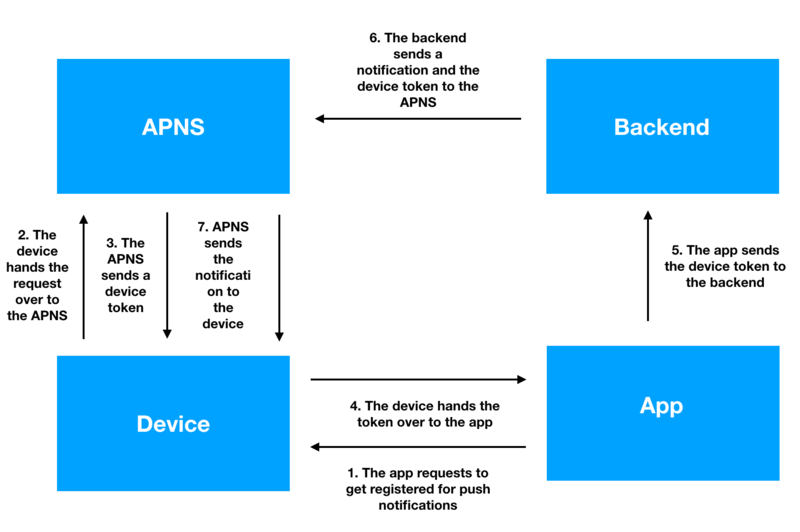 When the backend wants to send a notification to a device, it sends the message and the corresponding device token to the APNS. The APNS sends the notification to the device. So this looks quite complicated, but don’t worry. We will take a look at each step. You need to be enrolled in the Apple Developer Program in order to be able to create apps that can receive push notifications. Since this is also a requirement for publishing to the Apple App Store, you are probably enrolled anyway. You can do this of course also manually by logging into your Apple Developer Program using a browser. Using Xcode is more convenient though. As you can see, you just have to call the registerForRemoteNotifications. As you can see, one method is called if the registration was successful, and the other one is called if it wasn’t. The backend has to know the device token so that it can identify the device. So it’s the job of your app to send the device token to the backend. How this works depends on the backend you are using. The implementation of this kind of backend is not part of this tutorial. For example, you can do this by using a Node.js backend. There is something you have to consider: The callback for receiving the device token will be called every time the app gets started. In most cases, the device token doesn’t change – it’s possible though that it does! So your backend has to have some kind of service for updating the device token. For testing purposes, we will simulate the backend by using a Mac OS client. It doesn’t matter what kind of backend you are using – you always need a so-called push certificate, so that your backend is able to identify itself to the APNS. We need this certificate also for the Mac OS client, that will simulate the backend. 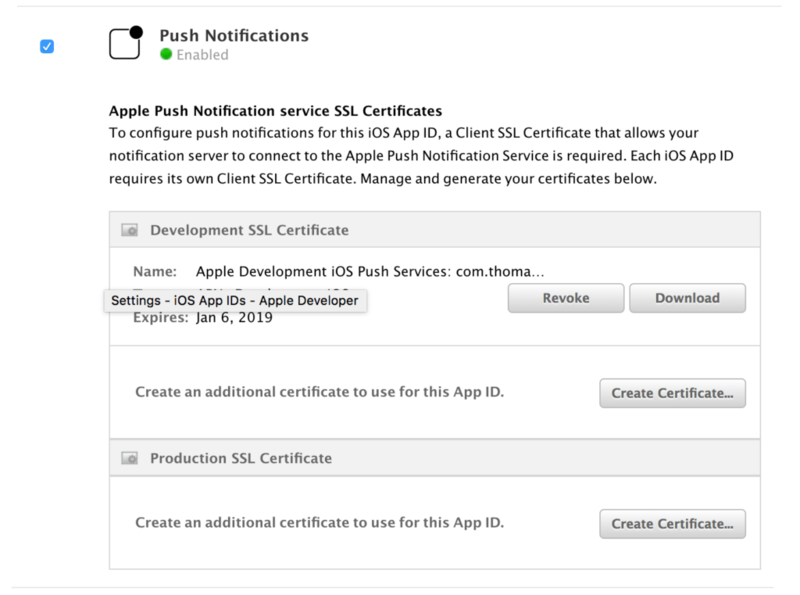 You can create the push certificate in the Apple developer portal. There are two types of certificates: a development certificate and a production certificate. Now we are ready to send a push notification! 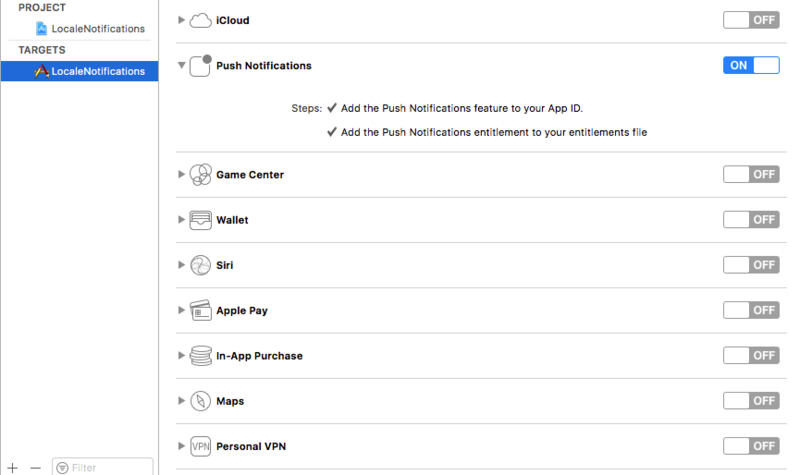 There are several applications you can use to send a push notification. In this tutorial we will use the Mac application Pusher, which you can download here. 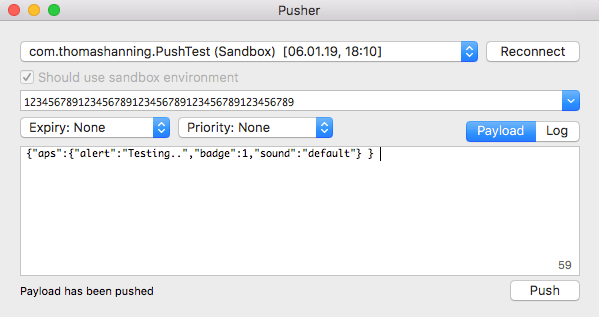 Since your push certificate is already in your key-chain, Pusher can read them out und you can choose the right one. Then, you have to paste your device token inside the text field. You can copy it from the Xcode console after starting your app on a device. This is enough for performing a test, so you can click on “Push”. Now the notificication is sent to the APNS and your device should receive a push notification on your device. Congratulations, you have sent your first push notification! Previous Post iPhone X: Safe Area Next Post Xcode for Windows?